Satellite processing is one of the types of ETL at the core of implementing Data Vault; this article focuses on the ‘vanilla’ handling of Satellite ETL. Exceptions such as Multi-Active/Multi-Variant implementations (depending on which flavour of Data Vault you use) or isolating Satellites from wide (denormalised) source tables or files will be documented in a separate post. 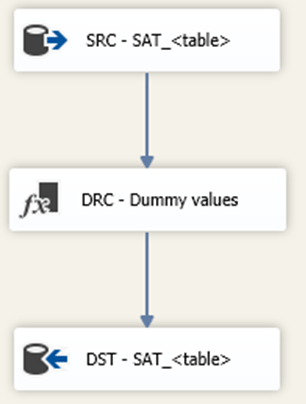 Satellite processing for Data Vault is in many ways similar to the process that is defined for the Historical Staging ETL process type. The main difference is the option to implement end-dating (expiry date/time) functionality, which is usually recommended for Satellites (not mandatory) and not for Historical Staging tables/ETL. For various reasons including reusability, parallelism and the option to remove the logic altogether, the end-dating functionality has been implemented as a stand-alone (separate) ETL process. This also will be documented in a new post. So for all intents and purposes the default Satellite process explained here can be labelled ‘Insert Only’, but will contain an EXPIRY_DATETIME attribute which will later be used by the end-dating ETL. As end-dating logic is redundant information added for performance reasons this is designed to be potentially removed without impact if required, and can even be virtualised in views or the BI semantic layer. This process is very simple in design; its purpose is to only insert a dummy record (starting with an effective date of 1900-01-01 or similar) to initiate the timeline for any record that was inserted in the Satellite. The dummy values cover the default values such as ‘Unknown’, ‘Not Applicable’, -1 or similar. The effective date can be set to 1900-01-01 (or similar) and the expiry date (or similar – optional) can be set to 9999-12-31. There is no requirement to lookup the correct expiry date as the End Dating logic will handle this in its own separate / dedicated ETL process. So, similar to the regular processing this step can be labelled ‘insert-only’. From a design perspective it is recommended to let each Satellite process handle its own dummy records, as opposed to driving this from the Hub process. The reason is that in this approach the Hub ETL does not need to be updated when a new Satellite is added. Depending on preferences (and performance) this could also be implemented in an Execute SQL Task. 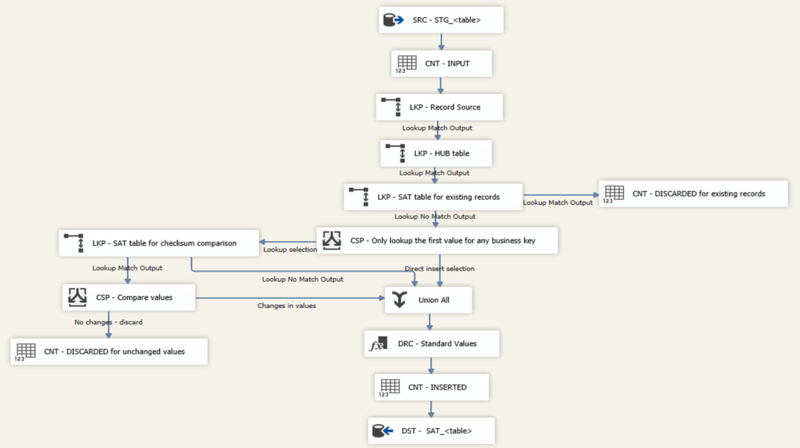 This wraps up the overview of how to implement a Data Vault Satellite process using Microsoft SSIS.